Askew Sisters, The | The Goose Is Out! We had an absolutely brilliant gig Upstairs at the Mag when Hazel and Emily Askew first came to the Goose, though sadly we had to turn quite a few people away as we just couldn’t get any more into the room! 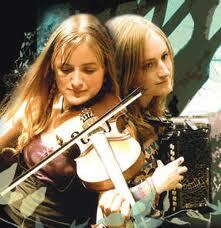 Emily and Hazel are a young duo making waves on the folk scene with their energetic brand of English folk music. Using fiddle and melodeon, they play and sing with an infectious enjoyment and love for the music, winning them fans wherever they go. From rhythmic foot stomping tunes to powerful interpretations of songs and ballads, their playing always guarantees to engage and inspire those who hear. Emily and Hazel made a welcome return to the Goose in 2012, since when they have gone from strength to strength. Their latest album, In the Air or the Earth, was released by RootBeat Records, to widespread critical acclaim, including the Spiral Earth Award for Best Traditional Album 2015. We are delighted that they will be headlining at The Old Nun’s Head at our first club night of 2016! Click here to go to The Askew Sisters’ website!